"This [Catalina Channel crossing] was mentally and emotionally the hardest [swim] that I have done," said Anthony McCarley. The entrepreneur from Berwyn, Pennsylvania completed the Triple Crown of Open Water Swimming with a 13 hour 0 minute crossing of the Catalina Channel today. 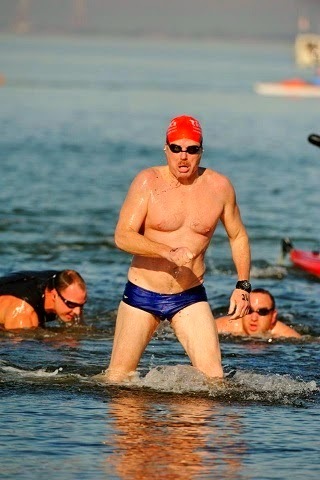 With a mighty effort that required him to dip deep, the 54-year-old became the 93rd person in history to complete the Triple Crown of Open Water Swimming. He crossed the English Channel in August 2013 in 13 hours 29 minutes, the Manhattan Island Marathon Swim in 9 hours 40 minutes on June 28th 2014, and the Catalina Channel 3 week later in 13 hours.